Soooooo...this St. Francis de Sales theme for 2017 has taken a really interesting turn. :0 Here we have me going through the biggest crisis in my career since I left legal practice 14 years ago, and suddenly St. Francis de Sales is sending me subliminal messages left and right about the simple devout life, and leaving me love notes, apparently. :0 I feel like it's God telling me that I can't always change my circumstances, but I can change the way I see and react to those circumstances. Case in point is the following. Grab your tea or coffee cup! Friday afternoon, let's just say that I had a WEE bit of a breakdown bad afternoon. I had 2 classes (my 9th and 10th of the same lesson that week), OK no problem, but then was just slammed with other unexpected "Quick, you must do this NOW before you leave!!" mini emergencies that have become so typical in our teaching experience this academic year: immediate fixes that needed to be made to our online Course Management System in all 10 of my sections, tons of grading, and answering/sending emails. Regarding that last item, I needed to send out emails to both the instructors and students (2 different emails) in each of the English sections, but one of our fixes involved sending a different message to people in Monday sections (yet 2 more different emails) as opposed to other sections, and in the frantic confusion, despite my care in distinguishing the Monday emails from the others, I sent the wrong email to the wrong people. I just...I had a moment. A series of moments, actually. I just felt furious that my happy, peaceful little job has turned into this frantic situation in which we're constantly in full out Panic Mode, and putting out fires. I always feel breathless, like I can't focus on any one thing, because there are 20 other debacles needing my attention, and like I am making so many mistakes due to the omnipresent confusion and developing emergencies. It has been a nagging source of frustration to me since mid-August. I took the weekend to settle down and re-evaluate things a bit. My job, despite its current set of challenges, has some really wonderful aspects, and I'm incredibly grateful to have it and contribute to our household in this way. I also read Chapter 3 of Live Today Well for our book club over the weekend, which focuses on prayer upon rising for the day. It REALLY had an impact on me. 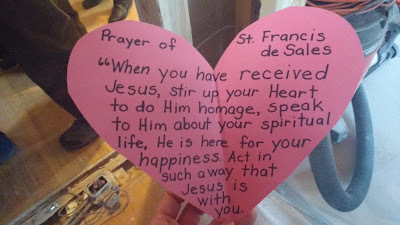 Like St. Francis de Sales teaches, I should focus on the positives, NOT on the negatives. This is Life: it is ALWAYS going to have some negatives. And if we dwell in that negative place, EVERYTHING seems negative, it's like a line of dominoes. However, if we make the choice to be happy, even in amidst a difficult situation, it makes the entire day seem brighter. "Fix Blackboard/ Group Disaster thing,"
...that gives you an indication of what my day was like yesterday. :0 But you know what? It was *fine*. I was still happy and calm, even during an in-class Crisis Moment that developed into full out Chaos when the group assignments didn't happen in our Course Management System the way that they should have. So I'm going to try to continue on this path. St. Francis has really come through at the right time. Have you had any St. Francis moments lately? I'd love to hear about them. *heart* And don't forget, Live Today Well book club tomorrow! Oh Tiffany, so sorry to hear about your disaster day! And yes, had a minor well not crisis of your magnitude, but was able to just ask God to calm me and went through rest of evening more in a St. Francis frame of mind. Had been to library on Monday and the librarians are suppose to say, did you know you have items due today. They didn't. So having a hectic day did not check my account until next day and found 9 overdue items. Ok so a dime per book would be minor enough but I had borrowed o set of DVD s that cost $1 per day fine. So was up to two before I got out today to return and of course, I had forgotten to include one of the dads! So another day's fine Garrett not drastic but since I live five minutes from a branch I had hoped to end overdue books this year and be a better steward of my money. Anyway, fuming over the cost and aggravation, I almost hit a woman in a crosswalk! Thankfully I didn't. Feel like St. Francis knew so well that if we take these aggravating moments and put them in God's hands, we can stay grounded in peace.